Russo-French Hebrew scholar; born at Kaidany, government of Kovno, June 17, 1816; died at Paris Nov. 18, 1892. When Senior was only one and one-half year old his father, Ẓemaḥ Sachs, became rabbi of Zhagory, also in the government of Kovno, and here he instructed his young son in Hebrew and Talmud. While still a boy Sachs manifested his predilection for Hebrew literature. Later he became acquainted with Joshua Klein, parnas of the Kaidany community, who furnished him with Haskalah books. Having read Erter's works, Senior purposed going to Brody in order to study directly under that author; but his early marriage, in accordance with the custom of that time, prevented the execution of this plan. He, however, left Zhagory for Wasilishok, where he studied during a whole year as a beneficiary of the bet ha-midrash. Then, after teaching for a year in Dubno, he finally arrived at Brody (c. 1839), where, through the assistance of Erter, he earned a livelihood by teaching Hebrew. Meanwhile he studied German and Syriac, and devoted the greater partof his time to reading scientific and philosophical works. 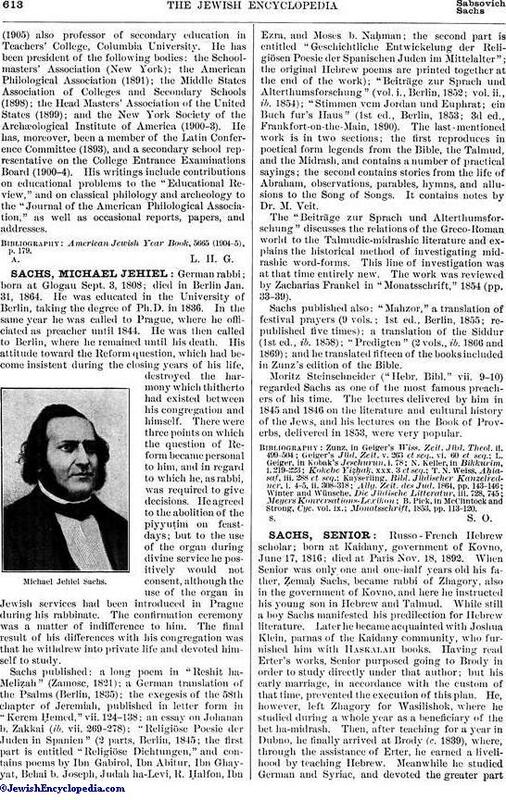 Sachs remained two years in Brody, and while there wrote an article in Hebrew on Russo-Hebrew scholars and on the education of the Jews in Russia; this he sent to Jost, who translated it into German, and published it in his "Annalen" (1840, Nos. 4-10), omitting, however, the author's signature. His parents having requested him to return home, Sachs set out on his journey, but, having no passport, was arrested on the Russian frontier. He was brought to Kremenetz, where he was thrown into prison, remaining in confinement five months, when he was liberated through the efforts of Isaac Baer Levinsohn. Sachs stayed at Zhagory six months, when he was invited to teach at Rossiena (Rossieny), where he remained till the end of 1843. At length he went to Berlin (1844), where he entered the university, attending particularly the lectures of Schelling and Althaus. In 1856 Sachs was invited to Paris by Baron Joseph Günzburg to become his private librarian and the tutor of his children. In Paris Sachs displayed great activity in various branches of Hebrew literature; but as he occupied himself with different subjects at one and the same time, most of his works remained unfinished. While in Berlin he had begun to edit literary periodicals, the first of which was "Ha-Teḥiyyah," treating chiefly of medieval religious philosophy. Only two numbers were issued, the first in 1850 and the second in 1857. 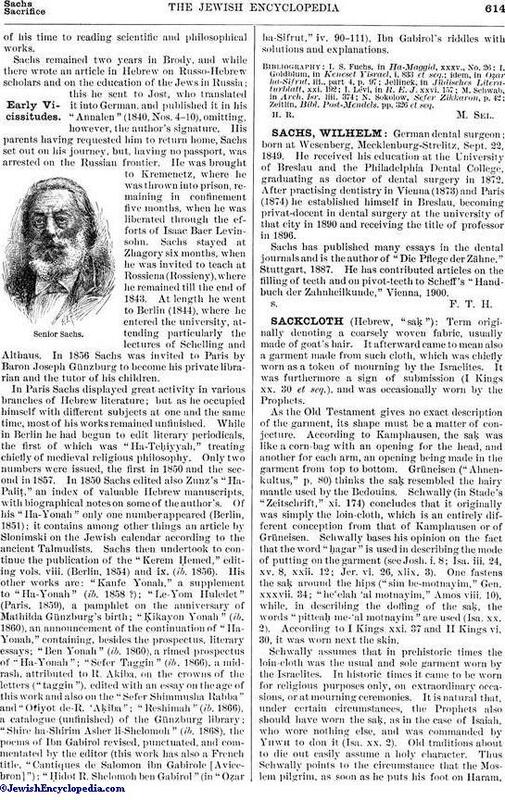 In 1850 Sachs edited also Zunz's "Ha-Paliṭ," an index of valuable Hebrew manuscripts, with biographical notes on some of the author's. Of his "Ha-Yonah" only one number appeared (Berlin, 1851); it contains among other things an article by Slonimski on the Jewish calendar according to the ancient Talmudists. Sachs then undertook to continue the publication of the "Kerem Ḥemed," editing vols. viii. (Berlin, 1854) and ix. (ib. 1856). His other works are: "Kanfe Yonah," a supplement to "Ha-Yonah" (ib. 1858 ? ); "Le-Yom Huledet" (Paris, 1859), a pamphlet on the anniversary of Mathilda Günzburg's birth; "Ḳikayon Yonah" (ib. 1860), an announcement of the continuation of "Ha-Yonah," containing, besides the prospectus, literary essays; "Ben Yonah" (ib. 1860), a rimed prospectus of "Ha-Yonah"; "Sefer Taggin" (ib. 1866), a midrash, attributed to R. Akiba, on the crowns of the letters ("taggin"), edited with an essay on the age of this work and also on the "Sefer Shimmusha Rabba" and "Otiyot de-R. 'Aḳiba"; "Reshimah" (ib. 1866), a catalogue (unfinished) of the Günzburg library; "Shire ha-Shirim Asher li-Shelomoh" (ib. 1868), the poems of Ibn Gabirol revised, punctuated, and commentated by the editor (this work has also a French title, "Cantiques de Salomon ibn Gabirole [Avicebron]"); "Ḥidot R. Shelomoh ben Gabirol" (in "Oẓar ha-Sifrut," iv. 90-111), Ibn Gabirol's riddles with solutions and explanations. Zeitlin, Bibl. Post-Mendels. pp. 326 et seq.